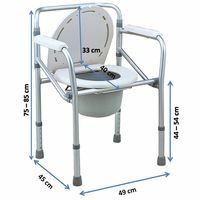 This drop-arm heavy duty commode chair is ideally suited for home use. 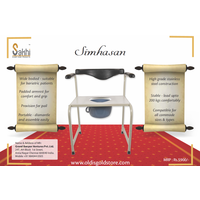 It can be used in the room as a bedside commode or placed on top of the Indian or western closet and used as a commode chair for toilet. 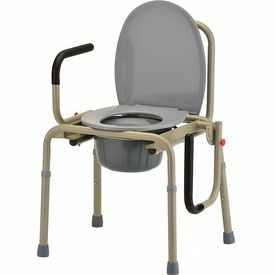 This can also be used as a bathing chair though for long life it should be wiped down and kept dry. 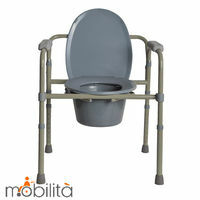 This model is one of the sturdiest commode chairs / bedside commodes available in the market. 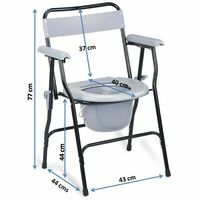 This drop-arm heavy duty commode chair is ideally suited for home use. 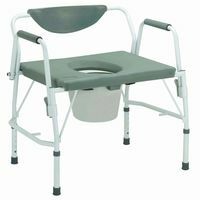 It can be used in the room as a bedside commode or placed on top of the Indian or western closet and used as a commode chair for toilet. 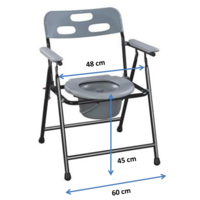 This can also be used as a bathing chair though for long life it should be wiped down and kept dry. 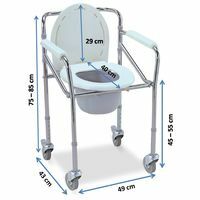 The Drop-Arm Commode is designed with a push-button arm release for easy patient transfer, weight capacity is 136 Kilos Has soft foam padded handles for additional comfort Bucket, lid and splash guard are included Seat height: 18.75" - 22.75"; Seat dimensions: 14"W x 16.5"D; Seat opening: 8"W x 9.75"D Width between handles: 18"; Arm height from seat: 8.75"; Overall dimensions: 23"W x 21.5"D This model is one of the sturdiest commode chairs / bedside commodes available in the market.